THE spread of ocean cruising in little ships dates from the end of the war of 1914-18 and the opening of the Panama Canal. Through the mighty lock gates has passed a stream of yachts, many of which would not have attempted Cape Horn or the Strait of Magellan. The pioneer single-handed circumnavigator, Captain Joshua Slocum, made his voyage in the ’nineties. He was a master mariner who had experienced misfortune, and his achievement stands out supreme in the annals of the ocean for efficiency and courage. It is not possible to arrive at any definite standard of comparison between Slocum and those who have followed in his wake, because the starting point of each single-handed voyage of circumnavigation is different; but Slocum was the first and his fame will never be eclipsed. Slocum was born in Nova Scotia, a part of the world from which came hardy adventurers who crossed the Atlantic in dories - flat-bottomed boats of the type carried in the fishing schooners on the Grand Banks of Newfoundland. There always has been intense rivalry between the sailors of New England and those across the border in British territory. The dory was the favourite type of boat used in the early crossings of the Atlantic. In 1867 two fishermen crossed from Gloucester (Mass.) to Southampton in a dory. Their trip is assumed to be the first, but it may be that there were earlier ones. A fisherman, Alfred Johnson, from the same town, Gloucester, sailed a 16-feet dory single-handed from Boston to England in 1876. He was followed in later years by a number of voyagers. The most persistent of them was William Andrews, who was neither a fisherman nor a sailor, but a mechanic. His first voyage was in 1878 with his brother in a 20-feet dory from Beverly (Mass.) to England. After this Andrews made various crossings single-handed, getting smaller and smaller boats until he achieved a passage from America to Spain in a collapsible boat only 14 feet long. the lone mariner had to right the boat as best he could and climb in again. It is much easier to sail from North America to Europe than in the opposite direction, as a small boat has to go south to get into the area of the northeast trade wind which will take her to the West Indies. After this she must turn north again to reach New York. A considerably shorter route is by way of Iceland and Greenland. This route is called the Viking route because it was the route the Viking ships took to Iceland, Greenland and North America about a thousand years ago. The hazards are so great that most srnall-craft voyagers prefer the longer and far pleasanter southern route. The Viking route is the graveyard of several stout little ships. A famous American yachtsman, William Washburn Nutting, sailed with three companions in his 42-feet cutter Liev Eiriksson from Norway in the summer of 1924. He called at Iceland and Greenland and was never seen again. The 40-feet ketch Shanghai, which had been sailed from Shanghai to Denmark by six Danes, was bought by an American who started for America by the Viking route. The Shanghai was wrecked near Cape Breton, Nova Scotia. Of the eastward Atlantic passages made single-handed one of the most remarkable is that of a German, Paul Muller, who made the crossing in a 20-feet boat in 1928. THE CIRCUMNAVIGATION OF THE WORLD by Captain Joshua Slocum single-handed in the Spray, a sloop 36 ft. 9 in. long. He set sail from Boston, Massachusetts, on April 24, 1895. After having called at Yarmouth (Nova Scotia) he set out across the Atlantic Ocean to the Azores and Gibraltar. He intended to enter the Mediterranean, but was dissuaded from doing so because of the reported activities of pirates. Siocum crossed the South Atlantic to Brazil and Uruguay and then passed through the Strait of Magellan. He called at the Juan Fernandez Islands and at Samoa he met the widow of Robert Louis Stevenson. Slocum continued his voyage to Sydney, Melbourne and Tasmania. Then he turned north to the Great Barrier Reef and sailed between New Guinea and the mainland of Australia. He crossed the Indian Ocean and passed south of Madagascar. He left South Africa at Cape Town and headed for the islands of St. Helena and Ascension. From Ascension he sailed due west to the coast of Brazil and went on to Trinidad and thence via the Leeward and Windward Islands to Newport (R.l.). His voyage of 46,000 miles ended on June 27, 1893. Captain Joshua Slocum, however, was the first man to circumnavigate the world single-handed in a small boat. Slocum became an American citizen. His Spray thus made her voyage under the Stars and Stripes. He came of seafaring stock, and rose from seaman to master mariner, having been captain and part-owner of a famous ship, the Northern Light, and afterwards owner and master of a small barque, the Aquidneck, which was wrecked on the coast of Brazil. In his book, Sailing Alone Around the World (Sampson Low), Slocum says that he sailed home to New York with his family in a canoe. He had then been a shipmaster for nearly twenty years, and had always been interested in shipbuilding. Moreover, he had planned the type of vessel suitable for all seas and all weathers. A friend offered Slocum an old sloop - called the Spray - which was rotting in a field at Fairhaven, opposite the famous whaling port of New Bedford (Mass). At that time steam had mastered sail and Slocum, in common with many other shipmasters, was “on the beach”. He accepted the offer and prepared to rebuild the sloop, with which he hoped to get his living by fishing. Having set to work with axe and adze, he stripped the Spray of her rotten wood and built what was virtually a new vessel, except that the sound parts of the old sloop were not wasted. She measured 36 ft. 9 in. overall length, 14 ft. 2 in. beam and 4 ft. 2 in. depth in the hold. Her net tonnage was 9 and her gross tonnage 12·71. She cost under £111 for materials, and took Slocum thirteen months to rebuild, although he stayed considerably longer than that at Fairhaven, as he secured occasional work fitting out whalers. His fishing venture proved a failure. He was confident of his handiwork and, convinced that he could sail his vessel single-handed round the world, he set out from Boston (Mass.) on April 24, 1895. The Spray was a new boat built over an old one. Slocum believed that the old hull was about a century-old and that the original Spray had been an oyster-boat on the coast of Delaware. He called her a sloop, but she had two headsails and a mainsail. This rig is called a cutter by British yachtsmen. He altered her to yawl rig during the voyage and also considerably reduced the long bowsprit. He relied upon copper paint for under-water protection against the teredo, or ship-worm, which is the bane of wooden vessels in tropical waters. He found this precaution satisfactory. The great beam and shallow draught are two features of interest. Still more interesting is the fact that Slocum obtained such a balance between sails and hull that the Spray needed no helmsman. Slocum lashed the wheel and she kept on her course. It was this fact that mystified many people, including men with considerable experience of the sea. This balance, of inestimable advantage to any ocean-going small craft, has been attained in modern times by Captain Thomas Drake, who knows how to build a boat with his hands as well as how to navigate her. The writer has been aboard one of Drake’s boats under sail and has seen her keep her course without a hand at the wheel and without the wheel being lashed. The Spray was beamy, but she was not slow and her light draught enabled her to use sheltered corners of harbours and relieved her intrepid owner of anxiety in shoal water. To prepare for the Atlantic crossing Slocum put in at Gloucester (Mass. ), where the fishermen gave him dried cod, copper paint, a fisherman’s lantern and various articles. Instead of obtaining a dinghy, he cut a castaway dory in halves and boarded up the stern where she had been cut. This dory also served as a washing-machine and as a bath-tub. As the cost of repairing his chronometer would have been £3, Slocum had to use instead a damaged tin clock. Some people are under the mistaken impression that Slocum relied solely upon this timepiece, which in the course of the voyage lost the minute hand and had to be put in boiling water to enable it to go. Slocum was a first-class navigator of the old school and was versed in the working out of what are known as “lunars”. So practised was he that he records finding a mistake in certain tables of logarithms. By observations of the moon he was able to check the clock and thus establish his latitude by methods not practised in these days of chronometers and wireless time signals. After he had put in at one or two places, the last being Yarmouth (Nova Scotia), where he bought the tin clock for the equivalent of six shillings, Slocum put to sea, passed Cape Sable (Nova Scotia) and set out for the crossing. He touched at the Azores. Shortly afterwards he fell ill through eating cheese and plums. He became delirious and lay in agony on the cabin floor while the Spray held her course for Gibraltar. He recovered and threw the remaining plums into the sea. His patent log was of great help, as this, combined with the practical knowledge gained by his years at sea, made him exceptionally accurate in his dead reckoning. 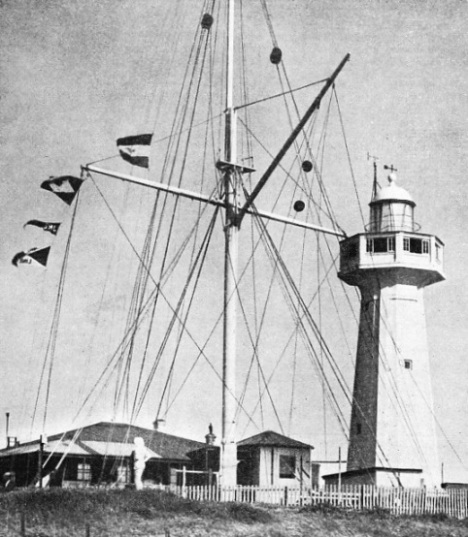 THE BLUFF LIGHTHOUSE and signal station at Durban, South Africa. From this point Slocum and the Spray were first sighted as they approached South Africa after having crossed the Indian Ocean. The signalman sighted the little Spray at a distance of fifteen miles. When the Spray arrived at Gibraltar Slocum was well treated by the British naval authorities. He was entertained and his boat was refitted, but he was advised to abandon his intention of sailing through the Mediterranean and the Suez Canal, because of the menace of Moorish pirates. Slocum took this advice and headed the Spray across the Atlantic again, this time for South America, but, even so, he narrowly escaped capture by a Moorish pirate felucca. He was saved by his courage and by the soundness of his gear. The felucca was overhauling the Spray in a strong breeze. Slocum realized that he had too much sail for the weight of wind and he reefed. A great sea caused the felucca to broach-to in a squall that dismasted her and, sweeping on, broke the Spray’s boom. By prompt action Slocum put the Spray into the wind and furled the mainsail before it was damaged by the broken boom. He then took up a rifle to defend himself from the pirates, but they were too busy with their troubles to attack him. His next task was to proceed under his headsails while he fished (repaired) the broken boom. In common with all blue-water men, Slocum hated sharks. On one occasion the Spray was followed by a dolphin and by three smaller fishes, and the lives of the quartet were threatened by foraging sharks. Slocum caused a diversion by towing a tin pan and shooting at the sharks. In South America he altered his rig by reducing the mainsail and adding a mizen, converting it into a yawl rig and thus splitting his sail area. A fortnight before Christmas he ran the Spray ashore on the coast of Uruguay and had a narrow escape when laying out an anchor; the half-dory capsized and Slocum could not swim, but he was able to right her and he managed to get the Spray afloat. The cheerful mariner’s passage through the Strait of Magellan is one of the epics of the sea. He had not only to contend with the head winds and dangers that beset every sailing vessel, but he was also in peril from the natives. He defended himself by his wits, using his rifle and a few carpet-tacks. His great problem was not to let the watching natives know that he was alone. He rigged a dummy figure on deck, went down into the cabin after having shown himself, and then changed his clothes as he went forward and emerged from the fore-scuttle as a third man. When the natives approached in their canoes he beat them off with bullets from his rifle and so won his way past Cape Pillar into the Pacific. A gale blew him back, however, although he fought it for days. Only by great efforts was he able to retreat unscathed into the strait, where he was again pestered by the natives. Before turning in he spread the carpet-tacks, points uppermost, on the deck. One midnight he was awakened by the yells of the natives as they put their bare soles on the tacks. He rushed on deck with his rifle and fired at the natives, who had retreated to their canoes. Having found some casks of tallow washed off a wreck, he salved the tallow and loaded the Spray with it. At last his patient courage was rewarded and the Spray emerged from the strait into the Pacific for the second and last time. At the island of Juan Fernandez Slocum found settlers. First he treated them to dough-nuts fried in the tallow and taught them the art of cooking dough-nuts; then he sold them the tallow. After having visited the monument to Alexander Selkirk, believed to have been the original of Defoe’s “Robinson Crusoe”, Slocum sailed across the Pacific for seventy-two days. He made a landfall at Nukuhiva, one of the Marquesas Islands and later landed on one of the Samoan Islands. Here he met Mrs. Stevenson, the widow of R. L. Stevenson. He went on to Newcastle, Australia, and sailed south to Sydney and then to Melbourne. His intention was to go south of Australia, but the weather was against him and, after a stay in Tasmania, he returned to Sydney and then set out for South Africa by the route north of Australia. This change of plan, with the previous change at Gibraltar, shows that Slocum was a wise man. He had every right to his own opinions, but he frequently took the advice of people of proved experience. Apart from the risk of pirates, which was considerable in those days off the Mediterranean coast of Africa, there was the question of the variable winds, and south of Australia Slocum was faced by the prevailing westerlies. He was always sure of himself, but was never opinionated. 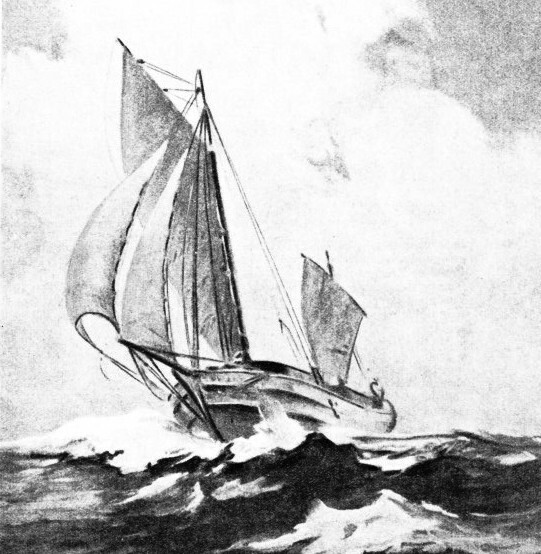 SLOCUM’S FAMOUS SLOOP, the Spray, from a beautiful painting by Maurice Randall. Slocum bought her as a hulk at Fairhaven (Mass. ), and rebuilt her. She had an overall length of 36 ft. 9 in., a beam of 14 ft. 2 in. and a depth in the hold of 4 ft. 2 in. It took Slocum thirteen months to rebuild her and the materials cost him £111. Then it took him from April 1895 to June 1898 to sail her single-handed 46,000 miles, round the world. Having left Sydney, the Spray headed north inside the Great Barrier Reef. She put in at one or two places and missed disaster by a few feet. Slocum was popular with the candid Australians. In Tasmania a lady, writing anonymously, sent him some money, but Slocum vowed that he would not make money out of Australians. He gave a lecture at one port and devoted the proceeds to help some miners who had been shipped back from New Guinea broken in health and penniless after a vain search for gold. After having put in at Thursday Island, the Spray sailed to the Cocos-Keeling Islands and on to Rodriguez and across the Indian Ocean to Port Natal, Durban. Here Slocum was visited by three Boer scholars who were preparing a work to support the contention of President Kruger that the world was flat. When he arrived at Cape Town he left the Spray and made a trip to Pretoria. He was presented to President Kruger by a judge who said Slocum was sailing round the world. This upset Kruger, who said the judge meant that Slocum was sailing in the world. At St. Helena Slocum was given a goat. As soon as the animal had found its sea-legs it ate the mariner’s chart of the West Indies. Then a tree-crab he was bringing from the Cocos-Keeling Islands broke out of its box and tore his sea-jacket, while the goat, devoured his straw hat. Directly he reached Ascension, Slocum landed the goat. To prove that he sailed alone Slocum had the vessel inspected when he was ready to sail and secured a certificate from the officials, who fumigated her to make sure that no one was hiding below. He then sailed towards Brazil and spoke to an American warship, which signalled that war had broken out between Spain and the United States. The Spray was not stopped by any Spanish vessels. As he approached the West Indies Slocum was worried by the lack of the chart which the goat had eaten. He was alarmed one night by what he took to be the white flash of seas breaking on a reef, and despite all his efforts he could not weather them. At last the Spray was tossed high by the seas and then Slocum was able to see that the flash came from the lighthouse on the island of Trinidad. THE DECK-PLAN OF THE SPRAY. Forward were the samson post, a pillar running from below the deck, and the windlass. Amidships Slocum placed his Caps Ann dory, a type of small boat used by fishermen off the Newfoundland coast. This dory had been cast away and Slocum cut her in halves, boarded up the stern and used her instead of a dinghy. 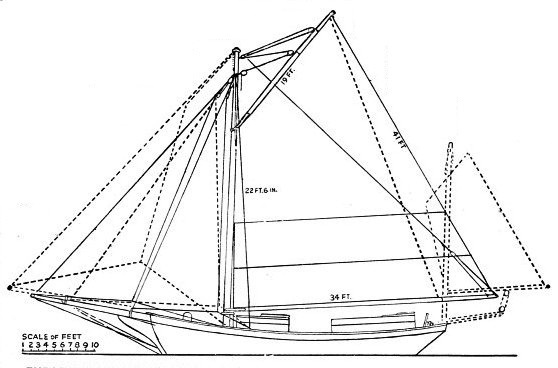 The jigger-mast is shown in the sail-plan below. Slocum tried to buy a chart in Grenada and in Dominica, but there was not one to be had, and he had bitter thoughts of the goat by the time he reached St. John’s, Antigua. From there he sailed for the shores of New England, getting into a sea in the Gulf Stream that proved too much for his worn rigging. He nearly lost his mast when the jibstay broke at the masthead; but he climbed the mast and managed to secure it. He was almost home when a tornado that had caused havoc in New York City struck the Spray, but the alert Slocum had not closed his weather eye. The Spray was under bare poles with everything snug and a sea-anchor out when the tornado reached the little ship. Newport Harbour (Rhode Island) was mined, yet the Spray’s light draught enabled Slocum to sail her out of the mined area close to the rocks and so into the port. He arrived on June 27, 1898, having sailed more than 46,000 miles in three years two months and two days. A little later he sailed the Spray to Fairhaven, and moored her where she had been launched. No one knows the end of Slocum and his famous Spray. He sailed her alone out of New York Harbour and was seen later by a schooner. The crew of the schooner warned Slocum of an approaching gale. He just waved his hand and was never seen again. It is thought that perhaps the staunch little vessel was run down at night by a steamship. Thus passed a wonderful man and a wonderful boat. Slocum’s cheerfulness and sense of humour were never dulled by his long, lonely passages and he won the esteem and friendship of everyone with whom he came into contact on his voyage. On his return to the United States his feat was obscured by the excitement due to the outbreak of the Spanish-American War. Most of his fellow countrymen failed at the time to realize the merit of his achievement. More than twenty years were to elapse before another single-handed voyage of circumnavigation was accomplished - and that voyage was not through the Strait of Magellan. Slocum was getting on in years when he sailed, but he was active and agile. He was a superb seaman with an iron nerve. The incident of the chase by the pirate felucca was particularly illustrative, when his seamanship impelled him to shorten sail despite his peril. As long as men sail the oceans in tiny vessels Slocum’s name will never perish. THE SAIL-PLAN OF THE SPRAY. The solid lines in the diagram illustrate Slocum’s original sail-plan. When he arrived off the coast of South America, Slocum altered the sail-plan as shown by the dotted lines. He shortened the bowsprit and the boom and added a jigger-mast with a jigger-sail. Sometimes he used a flying jib, as shown in this diagram, set to a bamboo stick on the bowsprit. You can read more on “The First Voyage Round the World”, “Great Voyages in Little Ships” and “Supreme Feats of Navigation” on this website.